Welcome to a new year of My Five Favorites today! Before we dive in to today's topic, I wanted to thank you all so much for all of your kind words on our Better Homes and Gardens magazine feature. I'm glad you found it interesting to see a bit of what goes on behind the scenes of a magazine photo shoot! My partners and I sure do enjoy putting this series together for you each month, and it seems that you all are enjoying it as well. 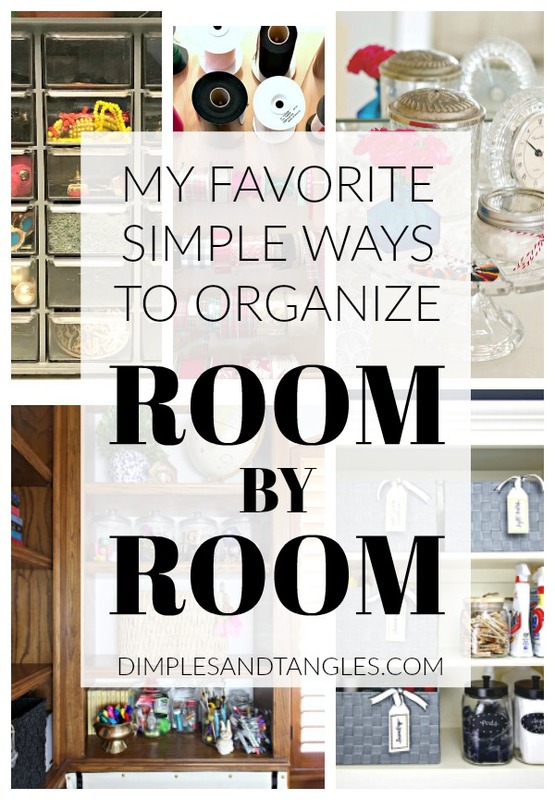 Pam from Simple Details, Lisa from Shine Your Light, Kris from Driven by Decor and I are all so excited to share some of our favorite ways to organize with you today. 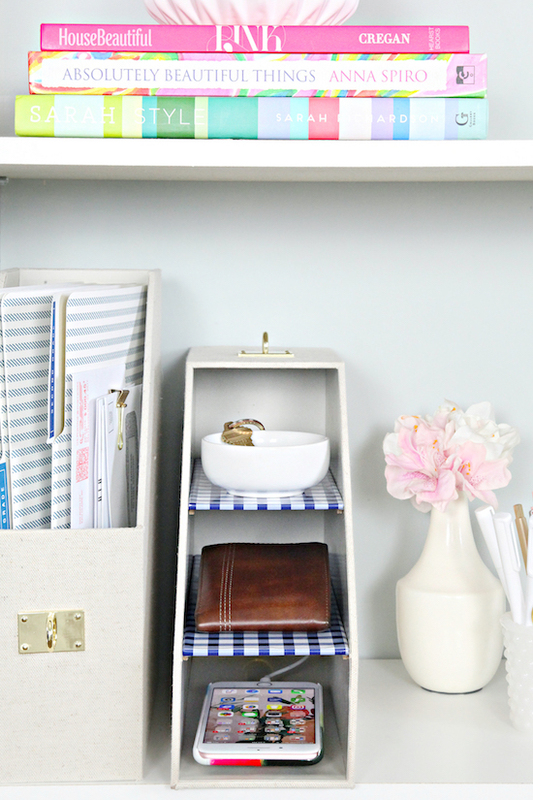 And, for a little twist, we're sharing one organizing idea from 5 different rooms in our homes. 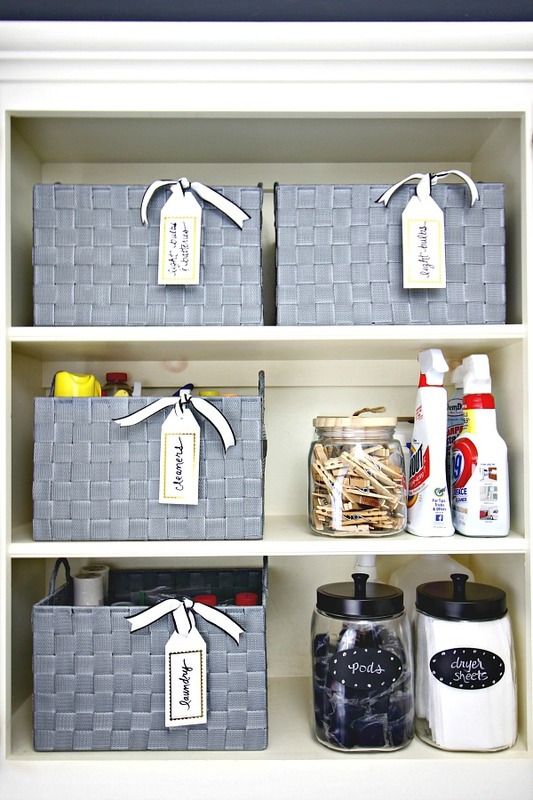 Read on for simple organizing tips from my Laundry Room, Master Bath, Closet, Office/Craft Room, and Storage Closet. We're thrilled to have Jen from I Heart Organizing as our guest host today. I mean, when organizing is the subject, there's none better! I met Jen a few years ago at the Sailing with the Scotts design cruise that we were both guest bloggers on, and she's as sweet as can be. I don't have to spend much time at all on her blog before I am inspired for a few projects around my house! I'm always a little hesitant when "organizing" is our theme because it's not my strong suit, but looking through Jen's projects has me ready to tackle some trouble areas in our home. Look at this clever way she used a magazine file... as an everyday essentials and phone charging station. And look how cute she made it to boot! I can't wait to see her favorite ideas that she's sharing with us today. I got this idea years and year ago from a friend that I used to teach with when I was visiting her home one time. Using a cake stand on a bathroom vanity not only helps corral some of my most used items while keeping them at my fingertips, but also looking pretty while out on display. Although not particularly pretty, but necessary, I like how my box of tissues kind of tucks right under it out of the way. It also works as a pretty great iPad stand to watch a favorite show while I'm getting ready for the day. 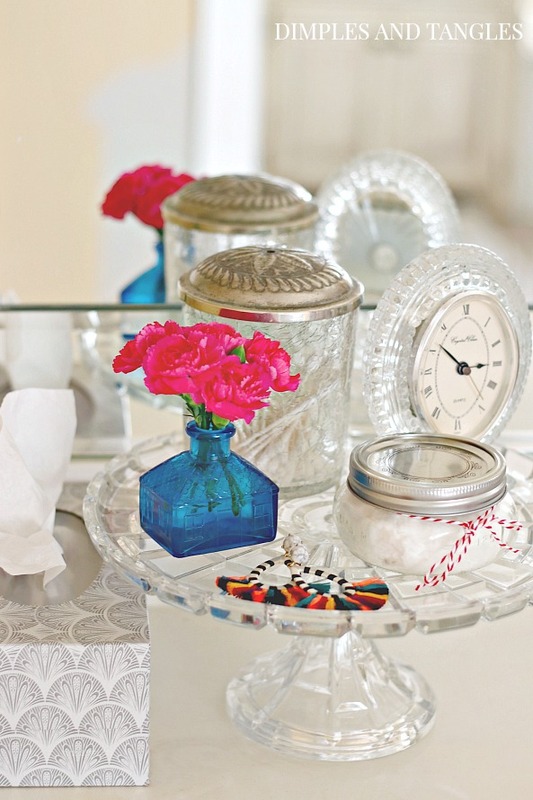 I bet you've got a cake stand or two that you can pull out of the cabinet right now and try this idea! Practical Tip: Make sure to choose a stand that can be easily washed or wiped down. Things like hairspray and dust will collect on it over time, and it's even nicer if you can just throw it in the dishwasher periodically. 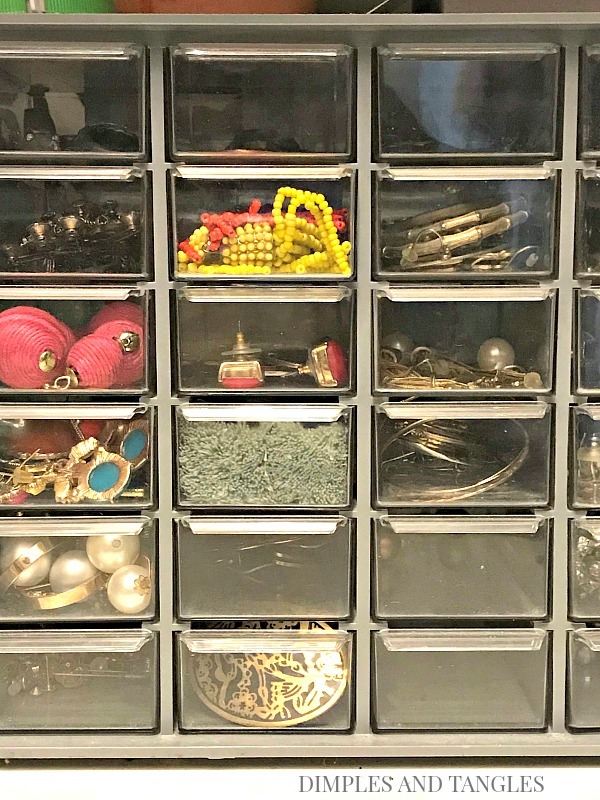 For as long as I can remember I've used a hardware storage cabinet with clear plastic drawers to store my earrings in my closet. Each drawer actually holds multiple pairs of most earrings, so I can group like kinds together. 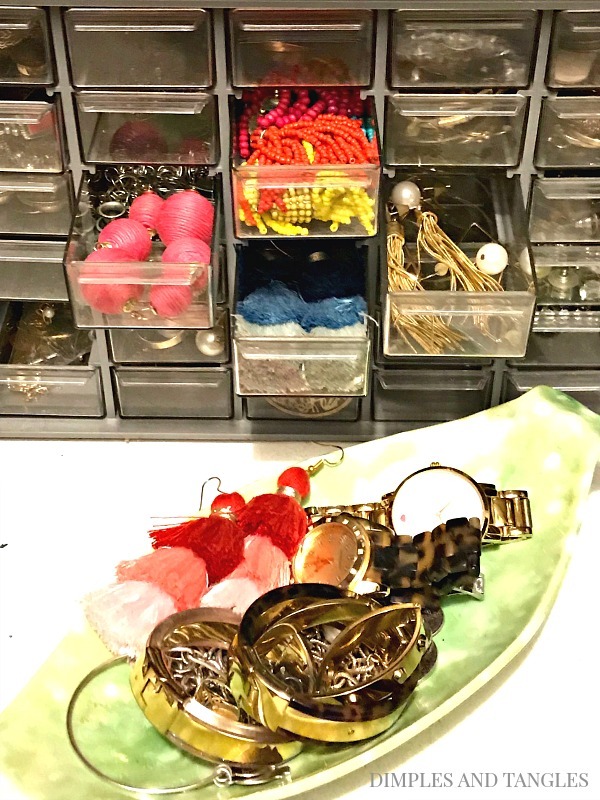 They are even easy to stack if you have so much jewelry that you need more space, or there are many other versions available with a combination of larger and smaller drawers if you like bigger statement earrings too. The drawers are great for necklaces and rings, too! 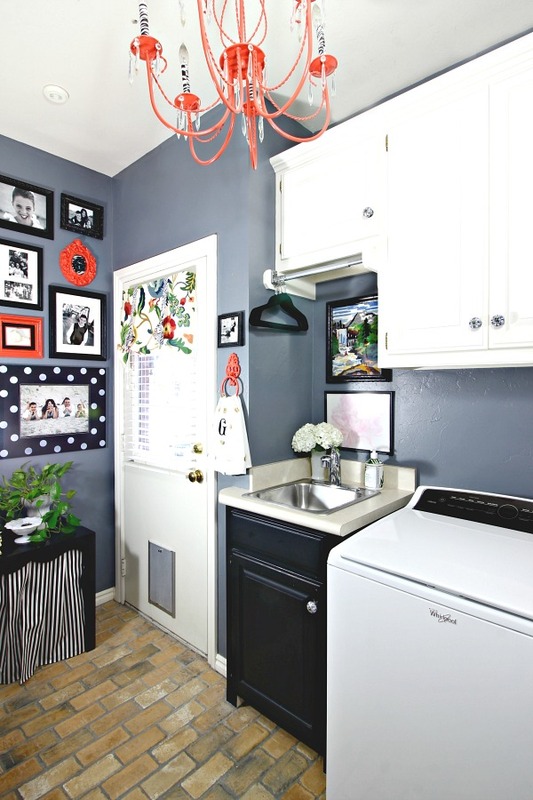 Last year my laundry room was long overdue an organizational overhaul, especially the cabinets over the washer and dryer. I had stacks of folded cleaning rags and other linens that refused to stay tidy, and cleaning supplies stuffed in wherever they would fit. Finding baskets that perfectly fit the shelves was the best solution! All of the textiles were now neatly contained, and a variety of cleaning supplies each had a designated (labeled!) home. Another bonus, the baskets were much easier to pull in and out from the higher shelf than trying to reach a single item that had been pushed to the back. 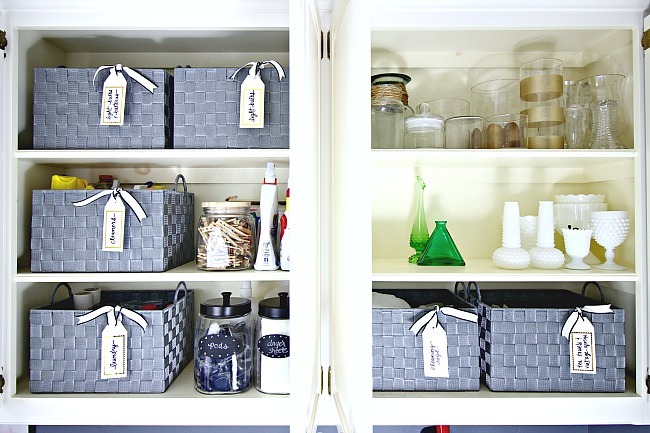 Shopping Tip: If you'd like to shop for baskets to organize your cabinet, be sure to take the measurements (and a small tape measure, I never leave home without one!) of your cabinet opening with you. I found so many baskets that were just too big by a fraction of an inch... "guessing" if they would fit was fruitless. Also, I recommend shopping for baskets with straight sides. Sloping sides cut down on the storage space inside and waste empty space on your shelf when a basket won't fit snuggly up against the one beside it. Years ago, the second home we lived in had a fairly large hall storage closet with lots of wall space. I recruited my Dad to build this ribbon rack for me, and it's moved through houses with us for almost 20 years! It's a fairly simple building project if you or someone you know is handy, the top section is just dowel rods fitted into holes drilled at an angle, and the bottom is dowels that slip in and out of open slots to add or remove rolls of ribbon. This isn't all of my ribbon stash, I have more stored in a tub, but it helps to have the ones I use most often very accessible. 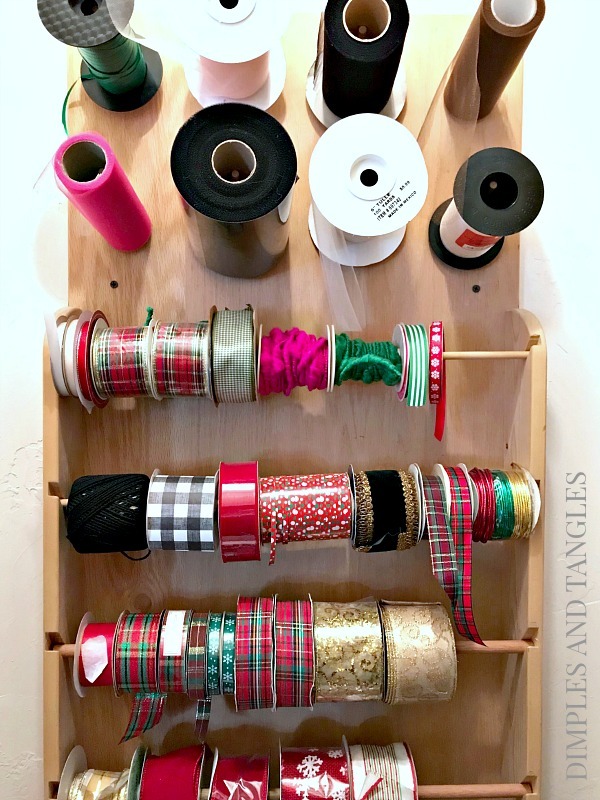 Shopping Tip: A ready-made metal wall mounted mug rack could serve a similar purpose, the tulle rolls would work well as is and you could stack several ribbon rolls together on one post. I hope one or two of those ideas sparked some inspiration for you today! Several of them are inexpensive, quick and easy to try. 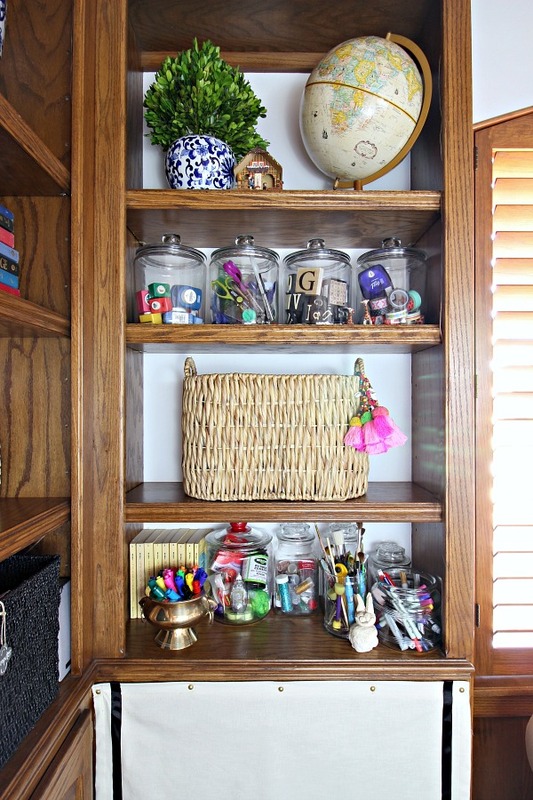 What's one of your favorite organizing tips for a certain room in your house? Be sure to head over to to check out more great tips at each of these blogs, too! Ahhh the glass canisters, that is an idea of yours I had tucked away and I'm so glad you brought it up today. I wanted a cute way to store arts and crafts supplies like markers and crayons on our bookcase for when my nieces and nephews visit (seeing as my littles are not so little anymore!) This would be fun and colorful, thank you for this and all your clever ideas! Oh my gosh, straight sided baskets. Brilliant! I have some glass jars too. These two tips really are motivating for me! I love the Baskets in Cabinets idea. Thanks for sharing an awesome home improvement tips.